Our 32nd annual Caring for Kids campaign concluded last week, and we’re excited to announce that we raised $341,365 for 14 local children’s hospitals! This is our third-highest total in campaign history, and it brings our grand total to over $7.5 million raised since 1979. First and foremost, we want to thank our dedicated team members and guests for their contributions of time, money, and hard work in making Caring for Kids a success year after year. Without you, this campaign wouldn’t be possible. We’d also like to extend a big ‘Thank You’ to our generous partners, especially The Neighborhood Ford Store. Their donation of a 2011 Ford Fiesta SES allowed us to raise over $120,000 through raffle ticket sales. And one lucky guest – John Springer from Johnstown, PA – got a special holiday surprise when his winning ticket was drawn by a patient at Children’s Hospital of Pittsburgh UPMC. Congratulations, John! John purchased his ticket at our Westmont location in Johnstown. Other partners that have made significant contributions to our campaign include Sheetz, Inc.; Nestle Professional Vitality, Pittsburgh Post-Gazette, KDKA Radio, and KDKA-TV. Thanks again to everyone who contributed to Caring for Kids. You are truly making a difference in our communities! 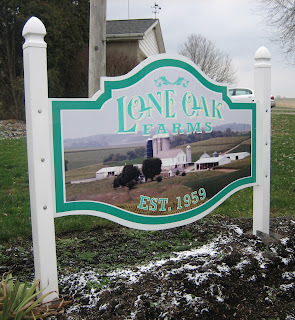 Last week, I told you about my visit with Lone Oak Farms, one of the farms that supplies Turner’s Dairy with raw milk (click here to read that post). But you’re probably wondering what happens to the milk between the farm and the supermarket. That’s where Turner’s comes in. But first, a little background on the company. The dairy was founded in 1930 (80 years ago!) by Chuck’s grandfather, Charles Turner. Since then, it has continued to expand and thrive, thanks in large part to the company’s commitment to extremely high standards. In fact, Turner’s milk regularly wins awards at the World Dairy Expo in Madison, WI – where they compete with much larger dairies in the heart of dairy country! The first thing Chuck pointed out on our tour was Turner’s testing labs, where all of their milk is tested for bacteria as it comes into the facility (as raw milk), and as it leaves to be distributed to customers. Turner’s adheres to even stricter standards than what’s required by the FDA, ensuring that their customers receive the highest-quality milk. As we left the lab, Chuck pointed out two enormous silos (below). After the raw milk arrives and passes bacterial testing, it is pumped into these silos, which each hold 50,000 gallons of milk. 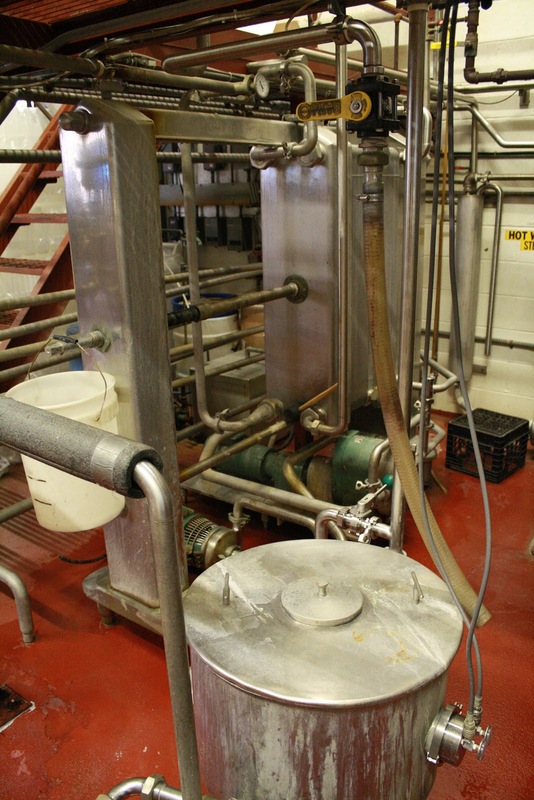 From there, we entered the processing facility, which houses room upon room filled with a maze of stainless steel pipes that transport the milk as it’s processed. Turner’s milk is pasteurized and homogenized through an energy-efficient system that utilizes heat transfer to ensure that no energy is wasted. 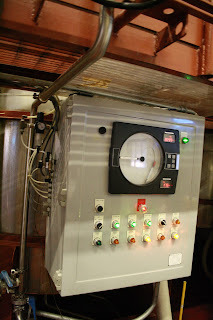 To be pasteurized, milk must be heated to 175 degrees, and held at that temperature for 20 seconds. After pasteurization, the milk is homogenized - a process which “explodes” the fat particles in milk so that the milk and the cream don’t separate when your milk’s sitting in your fridge. Next, Turner’s packaging room was a bustle of activity, with 4 separate systems working to bottle milk, iced tea, and juice. By far the busiest of these stations was the one that packed the milk into half pint-size cartons for use in schools. This station typically runs for 16 hours a day, 6 days a week. 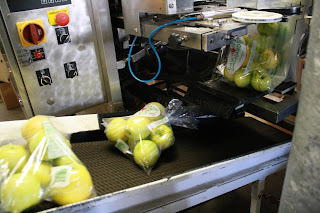 It was really cool to see the flattened cartons be folded, filled, sealed, and stamped in a matter of seconds as they made their way down the winding conveyor belt. I also watched as bottles of various sizes were labeled, filled, and capped. 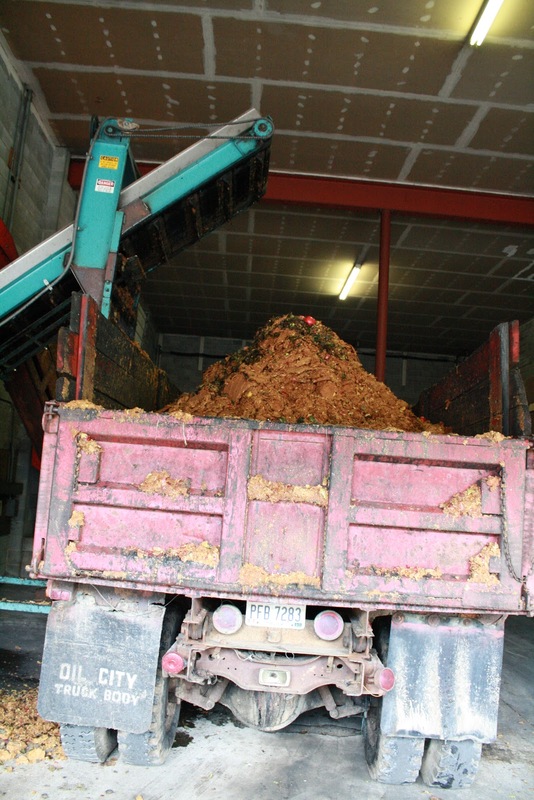 Processed milk is then loaded onto Turner’s trucks, which typically cover 50 delivery routes every day. In all, it only takes 36-48 hours from the time Turner’s receives the raw milk to the time it’s delivered to their customers. That’s fresh! My visit to Turner’s Dairy and Lone Oak Farms gave me a whole new appreciation for the milk that I enjoy every day. I take pride in knowing that Eat’n Park is not only using the highest-quality milk, but at the same time, we’re supporting local farmers by purchasing milk from Turner’s. Christmas is fast approaching, and thousands of children will likely be leaving a glass of milk and a plate of cookies out to reinvigorate Santa on his long journey on Christmas Eve. That long-held tradition hasn’t changed much over the last century, with one exception: in most cases, that milk will have come from a grocery store rather than the family cow or a neighborhood dairy. When you pick up that gallon of milk at the store, do you ever think about how it got there? I do, so I asked the kind folks at Turner Dairy Farms to enlighten me. Turner’s supplies Eat’n Park with many of our dairy products, including milk, half & half, egg nog, and more. So how does milk get from the cow to Eat’n Park or your local grocery store? To answer that question, Chuck Turner and his team gave me a full-fledged tour of their family-owned operation, as well as that of one of the farmers who provides their milk. Turner’s Dairy adheres to extremely high standards, and part of that includes knowing exactly where all of their milk comes from. Unlike many other dairies, Turner’s doesn’t purchase milk from a co-op. They work exclusively with 50 local farmers within a 70 mile radius of the dairy, and they hold those farmers to the same high standards. All of these farms supply Turner’s with rBGH/rBST-free milk. Turner’s inspectors visit with their farmers multiple times throughout the year to ensure quality and cleanliness standards and to verify that the cows supplying the milk are healthy and comfortable. One of those farmers is Chuck Carr of Lone Oak Farms. The barn and silos at Lone Oak Farms. 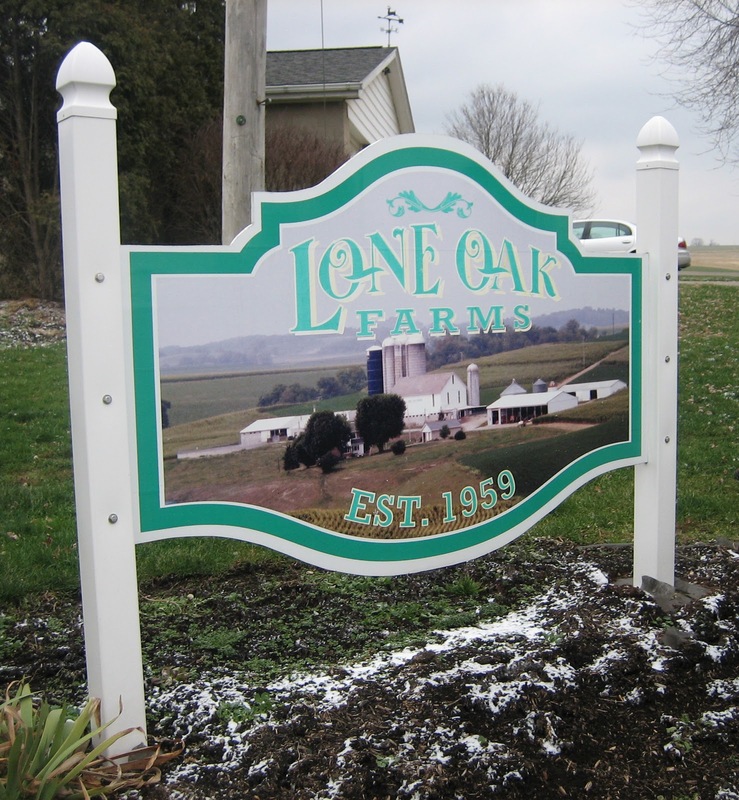 Lone Oak Farms in Westmoreland County, PA has been one of Turner’s milk providers for over 50 years. Owned and operated by 4 generations of the Carr Family, Lone Oak supplies milk from their 180 Holstein cows. Chuck Carr gave me some insight into the milking process. The cows at Lone Oak are milked twice a day, at 1 AM and again at 1 PM. The farm’s milking parlor is set up to milk 32 cows at a time. Each cow wears a transponder “necklace” that is registers the cow as she comes into the parlor. 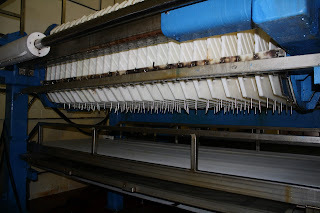 Once in place, each cow is fitted with the milking machine, and in 5-8 minutes, she’s done! In all, it takes the Carrs about 3 hours to get all of the cows through each milking. One set of stalls in the milking parlor. Each side holds 16 cows. I wanted to know more about the animals, so Chuck explained: The Carrs raise Holsteins because out of all the breeds, they provide the best fluid milk. 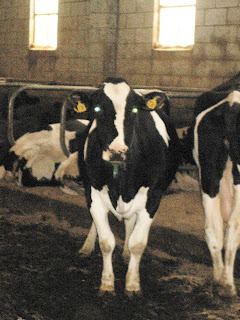 Some farms raise Jersey cows, which produce a richer milk with higher fat content that is better for cheese production. Holstein cows start producing milk around age 2, after the birth of their first calf. They typically produce milk until about 10 years of age, though most of the cows at Lone Oak are around age 6. Our tour of Lone Oak gave me insight on how high-quality raw milk is produced. But what happens next? 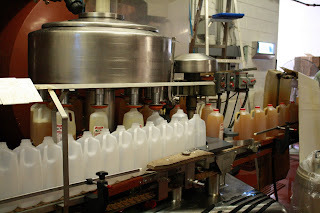 In my next post, read about how the raw milk makes it from the farm to your fridge. Eat’n Park Takeout – Name that location! Our latest series of commercials were filmed at locations around Pittsburgh, as our friend Ian answers the call of the wild: track down delicious Eat’n Park takeout! You’ll probably get a laugh out of some of the unusual situations he encounters, but can you identify the locations he passes through along the way? If you think you can, then enter our “Name that location” contest! Every couple of days, we’ll post a new scene from one of these commercials to our Facebook page. Take your best guess at where it was filmed, and you could win a $50 Eat’n Park gift card. Plus, everyone who participates will receive a coupon for 20% off Eat’n Park takeout. So, check out the commercials below, then take a look at the mystery scene at the very bottom. We made the first scene an easy one. Check it out below, then click here to enter your guess. And don’t forget to “like” our Facebook page so that you’ll know when we post a new scene. Good luck! Now, here's the first mystery scene! Can you guess where this was filmed? Click here to submit your answer. 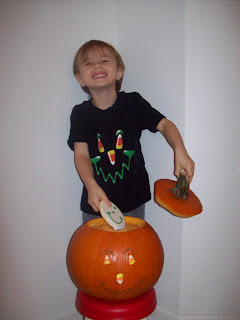 Contest ends December 26, 2010. The Eat'n Park Christmas Star commercial has become a holiday classic, and we love it when our guests share their fond memories of the commercial with us. This year, we decided to capture some of those sentiments on film. Watch below as some of our guests and team members share what the commercial means to them. And, of course, here's the original! Can't get enough? Click here to see when the commercial will be airing on TV, and here to read the full story behind how this classic came to be. Holiday Bonus Cards at Eat’n Park – While Supplies Last! Not sure what to buy for the friend who has everything? For your picky father-in-law? For the business associate who always saves the day? Eat’n Park gift cards are the perfect way to spread some holiday cheer – and treat yourself in the process! While supplies last, you’ll get a FREE $5 bonus card with every $25 in Eat’n Park gift card purchases. It’s like a reward for being such a great gift-giver! You’ll get one $5 bonus card for every $25 in gift card purchases, regardless of the denomination. So, if you buy five $5 cards, you’ll get one bonus card. Buy $100 worth of gift cards, and you’ll get four $5 bonus cards. You get the picture. Bonus cards are valid from January 1 through January 31, 2011, so you have a whole month to use them. But here’s the catch : We only have a limited supply of bonus cards, and we can’t make substitutions. So when they’re gone, they’re gone! Stop in to your local Eat’n Park today to get yours, then relax – holiday gift-giving doesn’t get any easier than this! Bonus cards are only available at Eat’n Park restaurant locations. This offer is not available with online gift card orders. 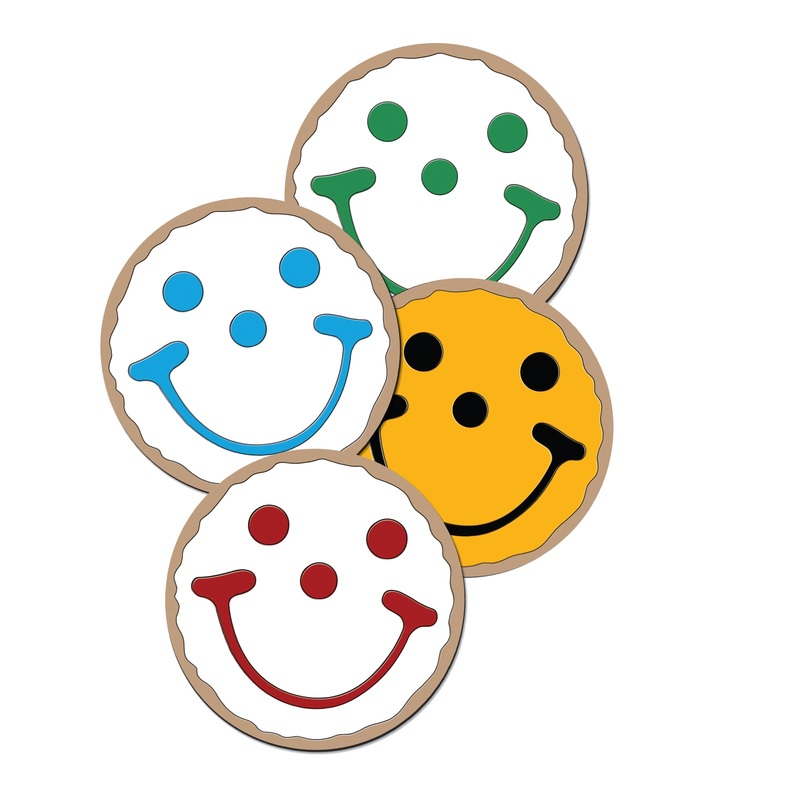 Since 1986, children at Eat’n Park have been enjoying a complimentary Smiley Cookie with every meal. It’s just one reason we’re known as the place for smiles! Now, we’re excited to announce two new options for kids. In addition to the original Smiley Cookie, children 10 and under can now choose from a Mini Smiley Cookie or an apple at the end of their meal. 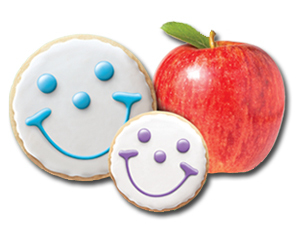 These new options are part of our LifeSmiles initiative, which aims to help children and their families make healthy choices. LifeSmiles builds in part on First Lady Michelle Obama’s Let’s Move! Campaign to decrease childhood obesity. Common goals of both programs are to provide access to healthy, affordable food and to increase physical activity. 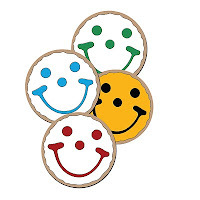 Through LifeSmiles, we’ll be investing $1 million and 20,000 volunteer hours over the next five years to support health and wellness initiatives aimed at families. For instance, in 2011, we’ll be partnering with the Pittsburgh Children’s Marathon as part of our commitment to promoting physical activity. 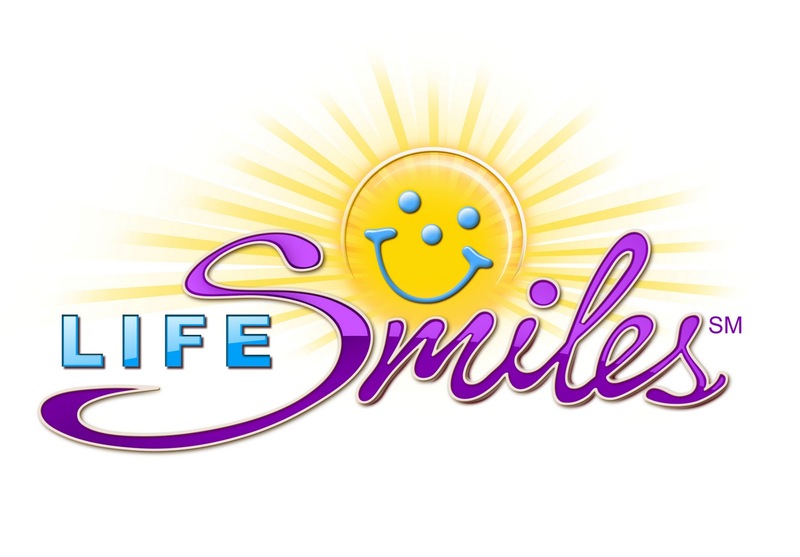 Of course, the principles behind LifeSmiles aren’t new to us. Over the last several years, we’ve made substantial commitments to promoting healthy lifestyles. LifeSmiles will enhance our existing programs like FarmSource, which since 2002 has allowed us to partner with the local agricultural and business community to provide our guests with fresh, wholesome foods; and Eat’n Smart, which gives our guests an easy way to identify menu items that meet their specific dietary requirements. Coupled with these programs, our investment in LifeSmiles will help us fulfill a critical need in our region by giving families the resources and the knowledge they need make healthy choices. Halloween Treat: Coupon for 20% off takeout at Eat'n Park, this weekend only! 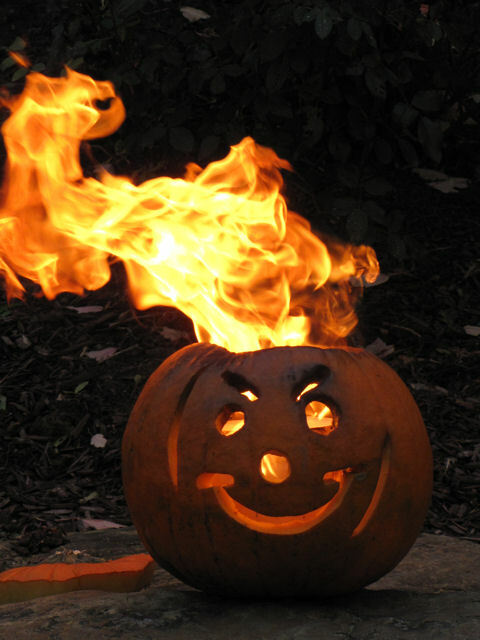 Halloween is already upon us, and between the many fall festivities taking place this weekend, you probably have a busy schedule planned. No time to cook? We can help! Make life easier by ordering takeout from Eat'n Park, and then save big with this coupon for 20% off your takeout purchase. 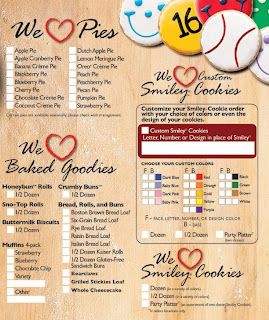 Just print your coupon, then bring it with you when you pick up your takeout order Friday through Sunday, October 29-31, 2010. Coupon valid Friday-Sunday, October 29-31, 2010. 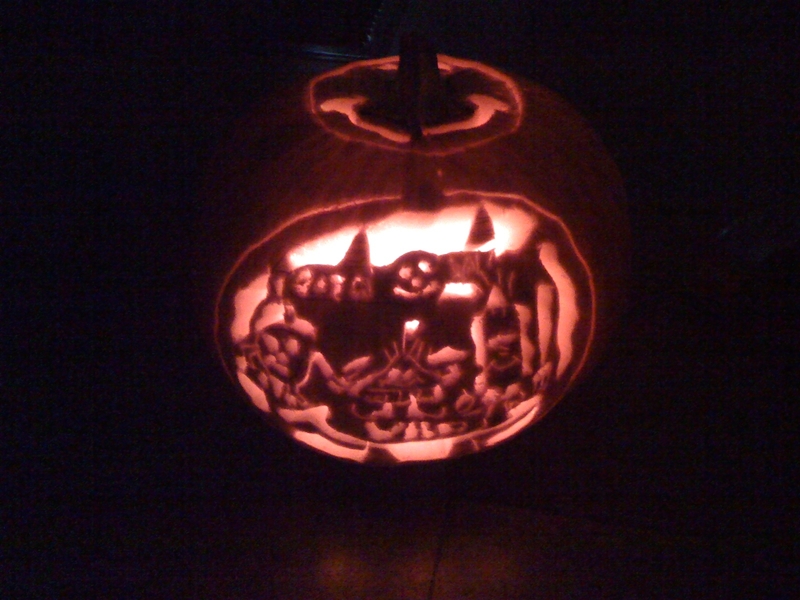 Eat'n Park Halloween Carving Contest Results! Thanks to everyone who participated in our Eat'n Park-themed Halloween carving contest! Below are the winning photos, as well as a few honorable mentions that we couldn't resist sharing. Enjoy! Kari B. of Imperial, PA. Love the Smiley pumpkin top! Charlie C., from Saint Marys, Georgia snatches a cookie from a unique cookie jar! 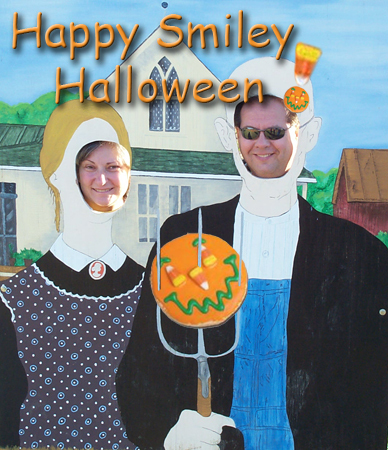 From one of our team members, Bill M. We never knew Smiley could look so scary! Bob J. of West Mifflin, PA. This one just made us laugh. Love your creativity, Bob! Elsie A. of Pittsburgh, PA. Great rendition of a classic smile! Fall is now upon us. It’s amazing how fast the summer has gone. Fall to me means pumpkin pie, winter squash and apple cider. If you haven’t visited your neighborhood Eat’n Park this month, I would highly recommend it. Along with our fall specials, we are now featuring unbelievable apple cider from several local orchards. With orchard-fresh cider, just the right spices, and an orange slice, this is the best hot cider you'll find anywhere! One of the orchards supplying our cider is Dawson’s Orchards, located in Enon Valley, PA – about an hour and a half north of Pittsburgh. 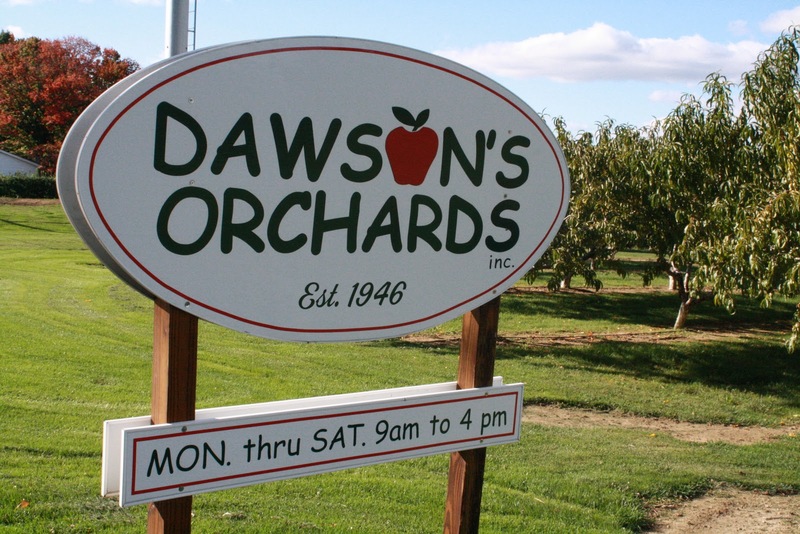 Owned and operated by Carolyn and Scott McQuiston, Dawson’s grows more than 15 varieties of apples, as well as an assortment of other fruits including peaches, pears, nectarines, plums, and berries. Because Scott and Carolyn are some of the nicest folks I’ve ever met, I asked them to indulge my curiosity by showing me just how an apple is grown, harvested, processed, and consumed, from orchard to cider press to Eat’n Park. Of course, they obliged! 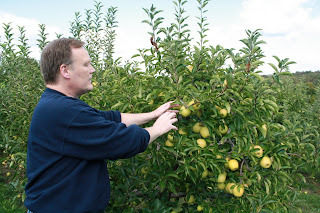 As Scott led me through the orchards, two of the first things I noticed were metal pots interspersed throughout the rows of apple trees, and a large windmill towering 40 feet above the orchard. 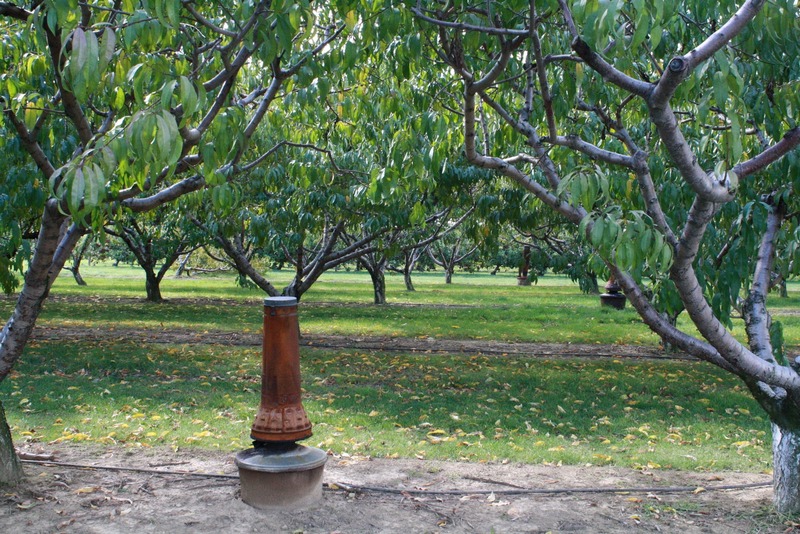 Top: A smudge pot in the orchard. Scott explained to me that the metal “smudge pots” worked in conjunction with the wind machine to raise the temperature in the orchard on those chilly spring nights, when the apple buds are in danger of being killed by frost. The smudge pots are essentially heaters. However, because heat rises, their effect would be minimal without the use of the wind machine. 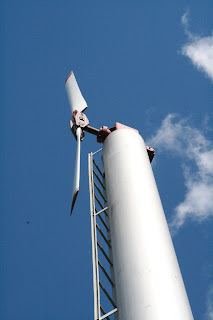 Powered by a car engine, the wind machine forces the warm air back down over the orchard, keeping the temperature warm enough to prevent the fragile buds from freezing. Next, Scott showed me some of the newest apple trees, and explained how they’re planted and supported. Many of these trees were trellised – supported with a stake near the trunk, and additional support wires running horizontally down the entire row of trees. As we got closer, I could see why these young trees needed so much support – they were absolutely loaded with apples! As they grow, young trees are pruned to remove any unnecessary branches, so that the tree can direct its energy into producing fruit. 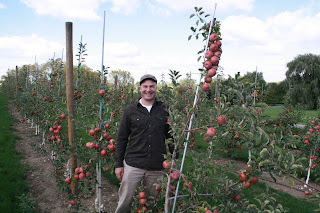 Top: Me among some of the young apple trees. Bottom: Close-up of a branch loaded with apples. 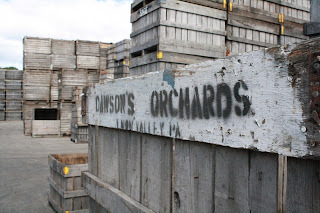 As we continued through the picturesque orchard, I noticed large wooden crates in some of the rows. Scott explained that as the apples are handpicked, they’re carefully put into these crates, which hold about 18 bushels each. The crates are then transported by forklift over to the processing and storage building, where they’ll be cleaned, sorted, packed, and stored. 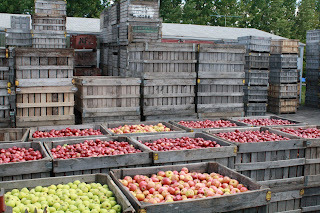 Top: Crates of apples ready to be processed. 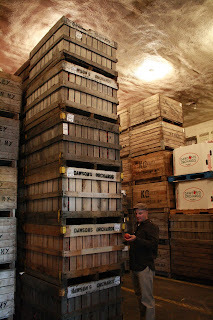 Bottom: Apples in cold storage. To begin the cleaning process, the entire crate of apples is gently submerged in a tank of water, causing the apples to float up. This is preferable to dumping them out of the crate, which would likely cause bruising and damage to the apples. Top: I watch as a crate of apples is submerged in the tank. 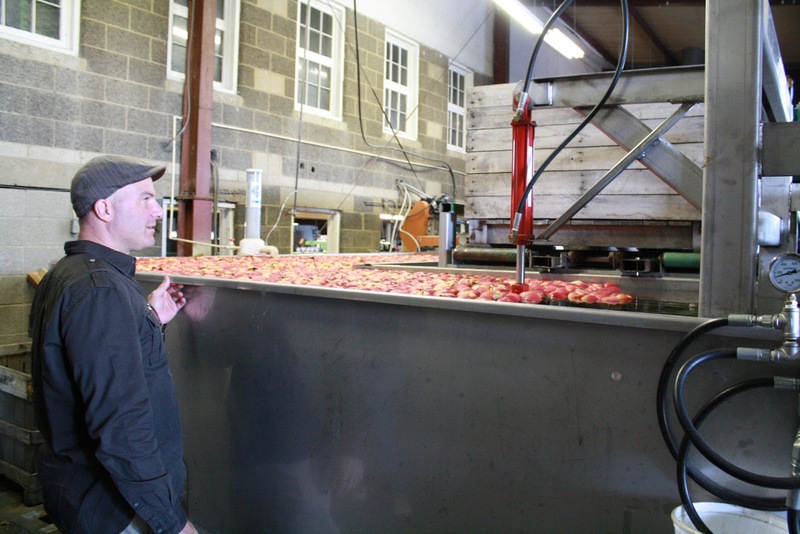 Bottom: Floating apples drifting toward the cleaning unit. Like a bunch of ducks in a ducky derby, the apples then drift toward a conveyor belt that takes them into a cleaning unit, then through a waxer. 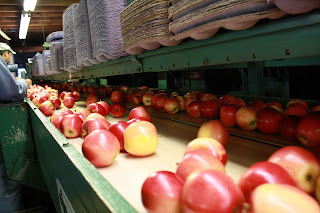 Clean and shiny, the apples roll out on the other side onto another conveyor belt, where they’re moved to a sorting line. Top: Apples on the conveyor belt to be sorted. 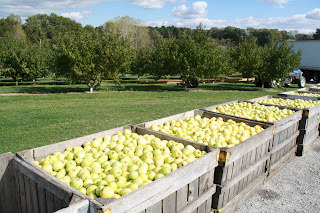 Bottom: Apples being weighed and bagged after sorting. From there, Dawson’s team members sort the apples, removing any that have been damaged at all during cleaning. 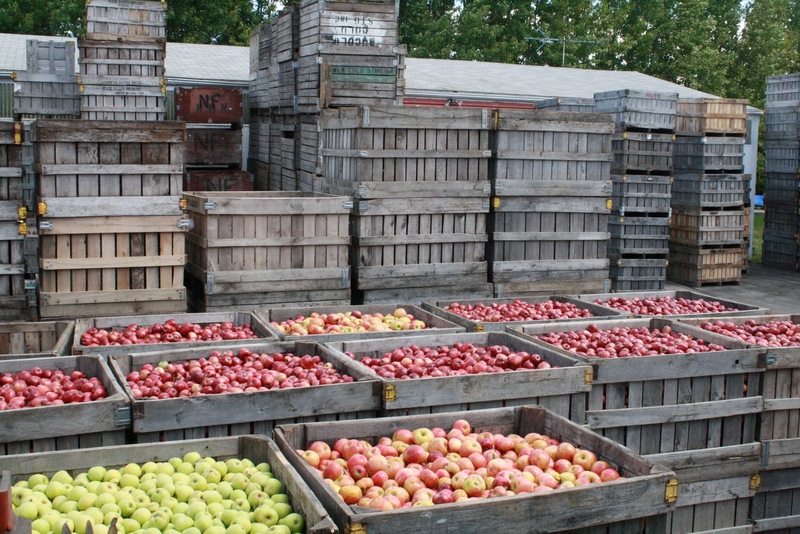 The remaining apples are sorted into 3 categories, based solely on their appearance. The best looking apples are “trayed” – meaning that they’ll be offered for sale individually. 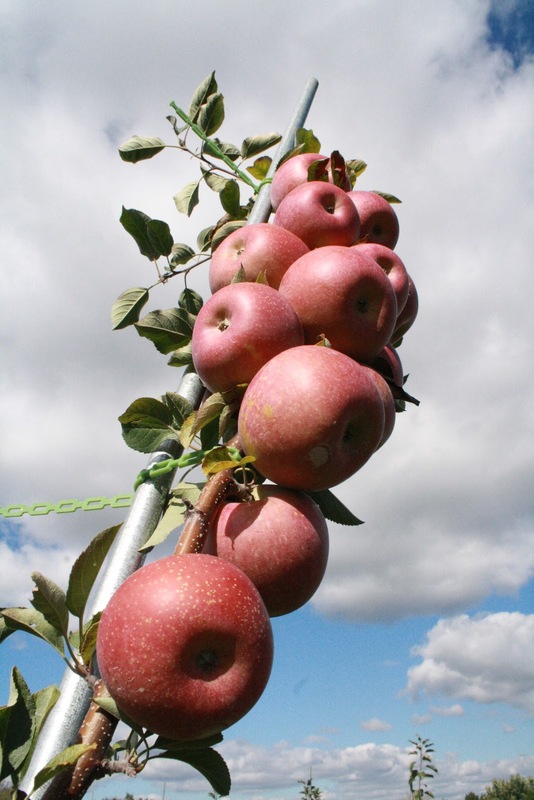 The second best looking apples are bagged for sale by the pound or bushel. 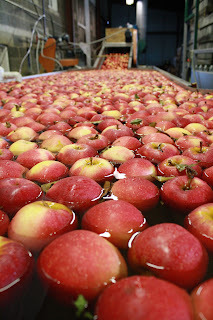 The remaining apples – which are just as good in quality, though not in appearance – are sorted for processing into cider. 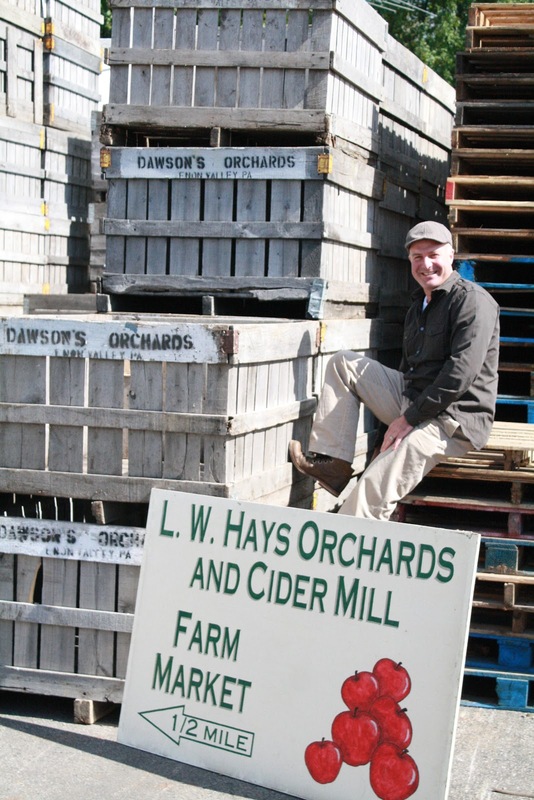 Dawson’s sends their apples to Hays Cider Press, 14 miles away in Columbiana, OH. I wanted to see that process too, so I made a trip to Hays, which I’ll write about in my next post. 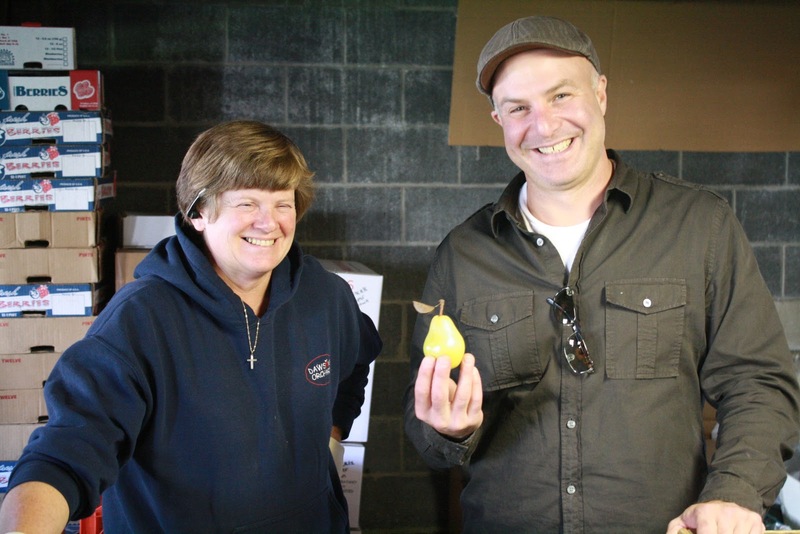 Top: ﻿Carolyn shows me some of the pears that Dawson’s grows. Bottom: Scott in the orchard. Before I could say my goodbyes to Carolyn and Scott, they insisted that I sit down and enjoy one of Carolyn’s (amazing!) homemade apple dumplings. They never let me leave hungry! To make sauce: Combine sugar, water, cinnamon and nutmeg. Cook 5 minutes; add butter. Pare and core apples while sauce is cooking. Add salt and baking powder to flour; cut in shortening. Add milk all at once. Stir until flour is moistened. Roll to ¼” thick; cut into 6 – 5” squares. Place one cut up apple onto each square. Sprinkle generously with additional sugar and spices and dot with butter. Fold up corners and pinch together. Place 1” apart in greased baking dish. Pour sauce over dumplings and bake at 375F for 35 minutes. Serve hot with ice cream or whipped cream. 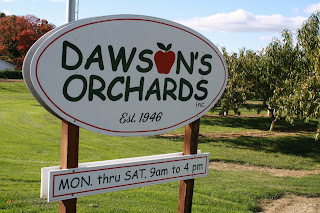 For more information about Dawson's Orchards, visit their website at http://www.dawsonsorchards.com/.